When you search for an event in your calendar, there are no suggestions during the typing in of the event name. For example, if you search for your event "Tennisturnier-Finale", but you just type the first letters, there are no further suggestions appearing in the system, the event is not appearing as if it is not entered. Steps to reproduce: Enter the first letters of an event into the search field. 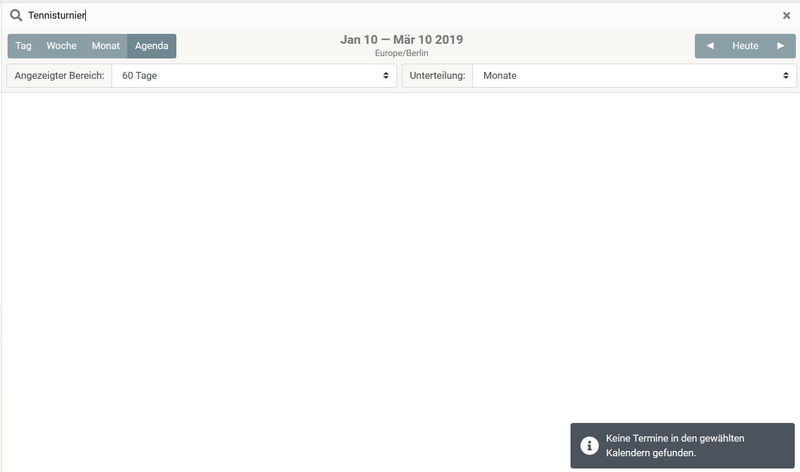 Actual result: There are no useful suggestions which help the user to find the right event name, and with not the exact name you can´t find the event. Expected result: There should be proper suggestions (events which begin with the same letters) as well as the event should appear even if you have not the 100% same title typed in. This video shows that while you search for "Tennis" there are so suggestions appearing. bohlender triaged this task as Wishlist priority.